You have written that the Federal Reserve remains on track to raise interest rates later this year and this will accelerate the capital inflows driving the dollar higher. You previously warned that this will also set off further defaults in emerging market debt and you have also said that the pension funds desperately need higher rates to survive. But higher rates will blow up the government budget. This seems like a real mess. Is there any way out of this nightmare? ANSWER: NO, this is all inevitable. The Fed will be forced to raise rates, and both Congress and the media will blame them for not raising rates sooner and for creating an asset bubble. They will have no choice because that is their job, as expected from the public at large. Even in Australia and Canada where there are real estate booms going on in Sydney and Toronto, criticism is rising attributing the booms to low interest rates when in fact it is foreign capital inflows that have some calling Canada the new Switzerland. The problem is always blinders on with analysts who only see everything domestically and are ignorant of international capital flows. They play with government budgets and money supply and attribute everything to domestic consequences. They help to keep the majority the victim in these major international events. We have asset bubbles in property that will be blamed on low interest rates when it is driven by capital flows. The Chinese are the biggest ticket buyers in US property while Canadians are the biggest buyer in the number of properties in the United States. So just like the 1987 Crash caused by the G5 currency manipulation, the domestic analysts always turn out to be the fool since they cannot see the wildcard coming in from the outside. The Fed will have to act regardless of the impact upon the Federal budget. They raised rates under Volcker to insane levels, despite the fact that it raised the national debt from $1 trillion to $6 trillion on interest rates alone. So, the budget has NEVER prevented the Fed from raising or lowering interest rates in the past. 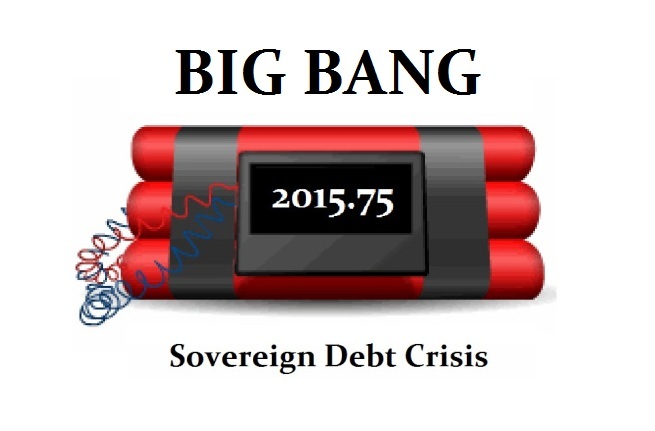 However, raising rates in this environment will cause national debts to explode. This is the Fed now trapped and this is what central banks are scared about. They have lost control and the old theories are collapsing. The desperate move is to tax money, eliminate cash, and go negative on rates but that too would compel selling of government debt producing the same net effect as raising rates – eventual monetization. Negative rates will compel the central banks to buy the debt when private entities will not while raising interest rates will explode the deficits. Either way leads to monetization. Manipulating interest rates is its only real tool. Buying in paper as in QE1 to 3 is indirect and there is no guarantee those who sell them the debt are domestic holders so the stimulus leaves. This is the classic battle between DEFLATION and INFLATION. This is the essence of BIG BANG. Governments have become addicted to low rates that it has reduced their interest rate expenditures, creating a false sense of budgets under control. 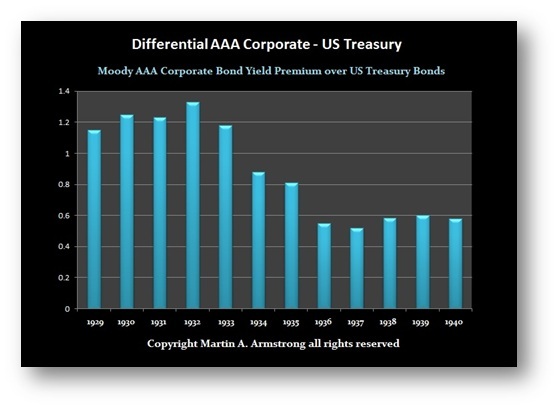 When rates start to rise, that is when capital will shift from PUBLIC to PRIVATE to get away from insane government debt. That is where rates would normally rise with no bid. Yet, we may see central banks forced into buying government debt when no one else will both if rates went negative or explode and capital flees government moving to corporate debt and shares as began to emerge during the Great Depression after the sovereign debt default of 1931. That may soften the rate rise, but it will merely transfer the debt into monetization without interest, and that will produce the ASSET INFLATION that should emerge. That will not appear because of an increase in money supply, but because of a collapse in PUBLIC CONFIDENCE. The impact in the pension funds further accelerates the mess. Here, pension funds chased long-term rates to match their maturities and that drove long-term rates lower. Some have run off to emerging markets desperately trying to get yield. An uptick in rates is needed to make them solvent yet most pension funds will lose money on the uptick because their current domestic paper will decline in value and those who bought emerging market higher yield will be slammed. This will force more people to invest in stocks as well. The emerging market debt issued in dollars will blow up, and as I wrote before, municipals in Germany are starting to issue dollar debt at zero interest rates trying to play the decline in the Euro. Obviously, there are so many layers to this debt crisis you cannot focus on just one fundamental relationship. This is a convergence of many trends going wrong all at the same time. This is the classic flaw in analysis. The typical attempt is always to reduce everything to a single cause and effect. Every government investigation tries to lay blame on one cause. This is a fools game for events are NEVER the result of a single cause. You must see the world dynamically and this is why there are so few good hedge fund managers who can grasp the world and play the capital flows no matter where they lead. The person who can only discuss matters in domestic terms will never make the cut.